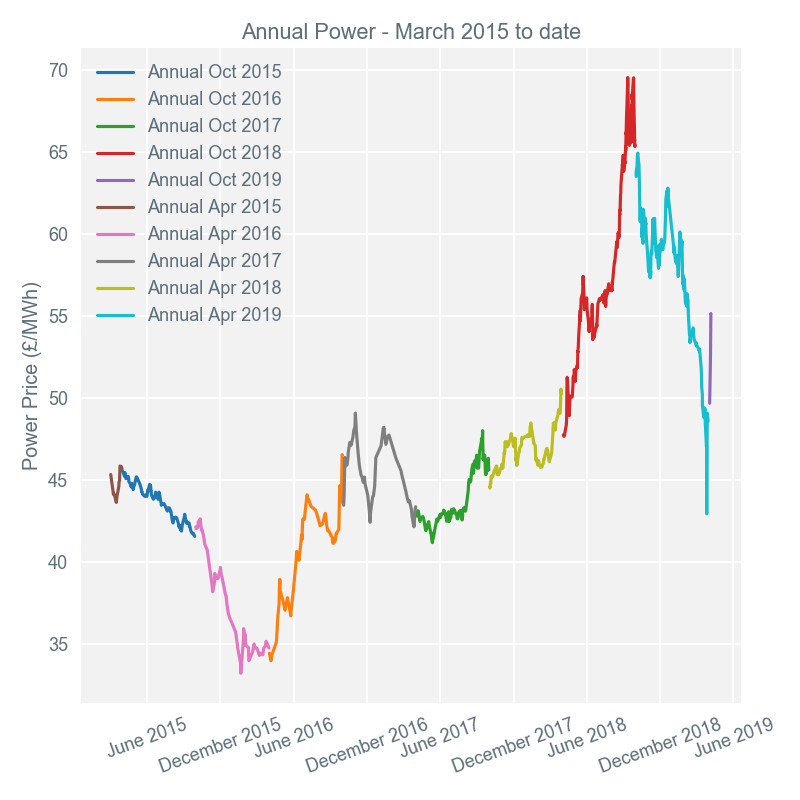 Day-ahead baseload power prices averaged £42.35/MWh during week 14, £0.50/MWh up on the previous week. 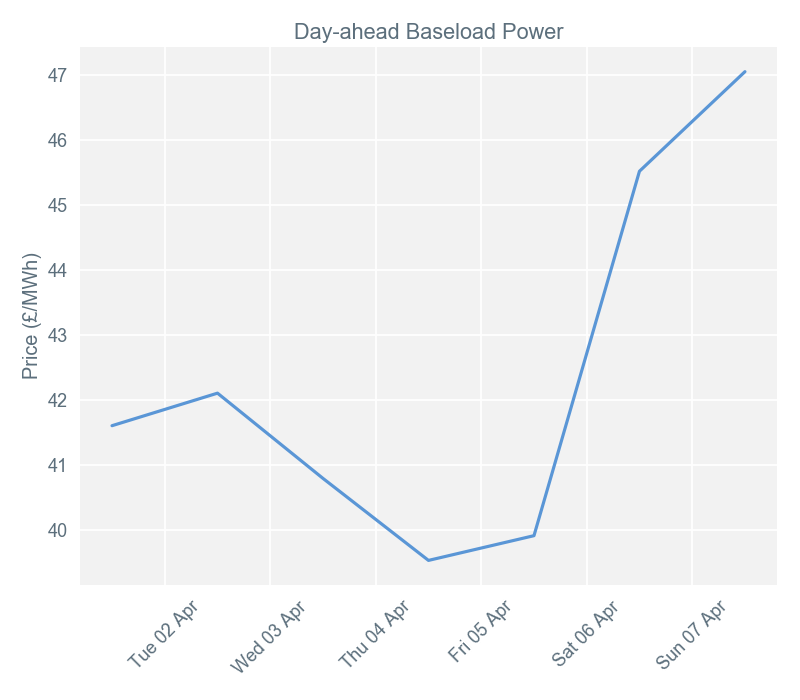 The highest price for day-ahead baseload power was £47.15/MWh on Sunday 7 April. There was a strong link between this price and the sharp drop in the Norwegian gas supply to Britain, which fell about 70%. It went from 64mcm/day (millions of cubic metres per day) on Thursday evening (4 April) to 18mcm/day on Friday morning (5 April). This fall, combined with cooler weather conditions, pushed the day-ahead price upwards. 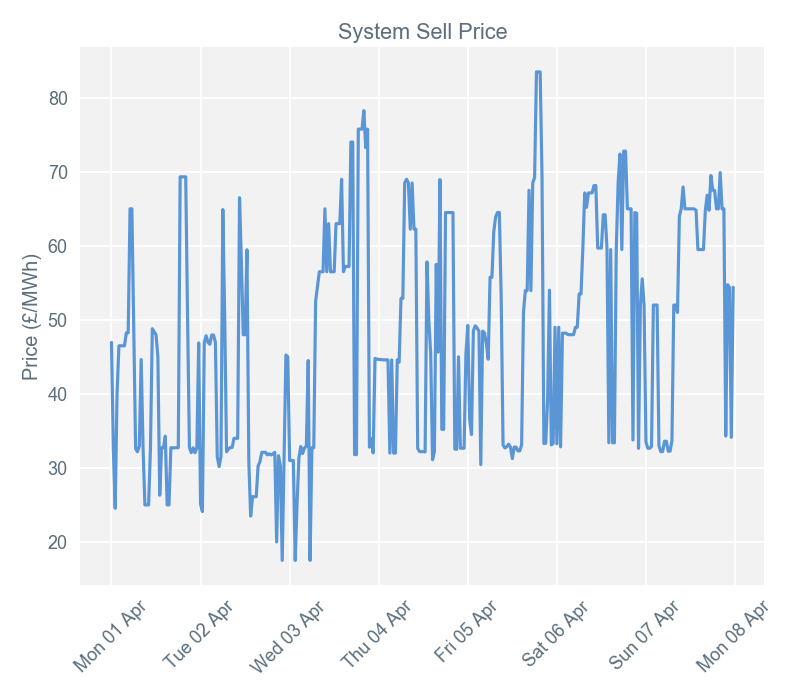 Thursday 4 April saw the week’s lowest price (£39.25/MWh) for day-ahead baseload power. This was due to the forecast for wind production to outturn above the level of Wednesday 3 April and squeeze gas fired production out of the generation stack. Settlement periods 38, 39 and 40 (18:30 – 20:00) on Friday 5 April all saw the week’s highest imbalance price of £83.50/MWh. In the settlement periods before the earliest of this trio, solar and wind combined had dropped from 9.5GW to 7.3GW. With gas fired generation already ramping up by 500MW, National Grid called pumped storage hydro into action. The final price was set by accepting offers from Sloy Hydroelectric Power Station to increase its generation. Settlement period 45 (22:00 – 22:30) on Tuesday 2 April, plus periods 4 (01:30 – 02:00) and 11 (05:30 – 06:00) on Wednesday 3 April all shared the week’s lowest imbalance price: £17.50/MWh. In all three periods, wind generation had picked up, reducing demand for the typically more expensive gas generation. The final prices were set by accepted bids from Peterhead Power Station to reduce its gas fired generation. The UK saw mild levels of renewable generation during week 14, with both solar and wind having one stand out day of performance. Wind generation averaged 6.3GW during the week, up 1.2GW from the previous week. It peaked at 12.1GW on Thursday 4 April, when contributing the equivalent of 31.2% of UK electricity demand. 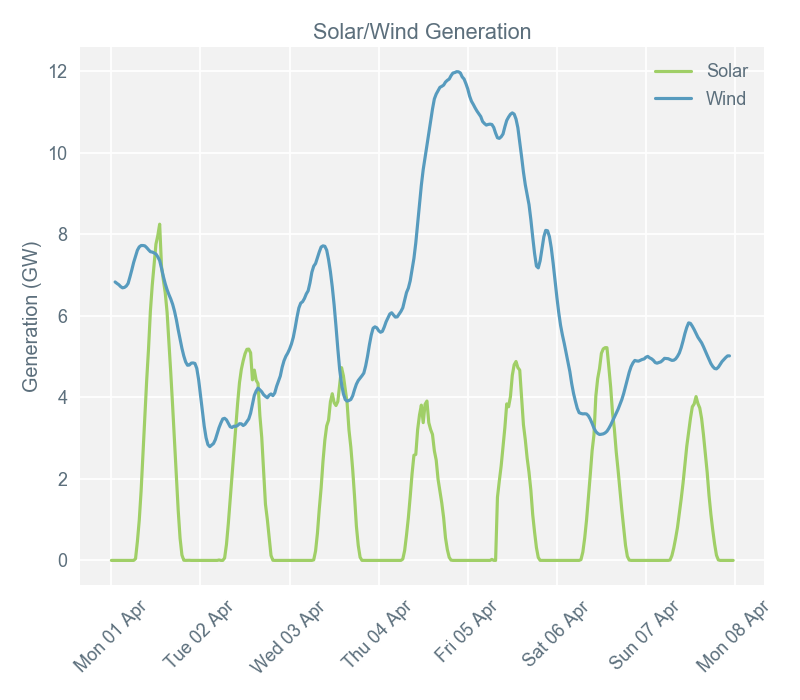 Solar peaked at 8.1 GW on Monday 1 April, when it was generating 19.9% of the UK’s generation stack. Together, these weather dependant sources of technology peaked at 15.4GW on Monday 1 April when generating a combined 37.1% of the UK’s demand. 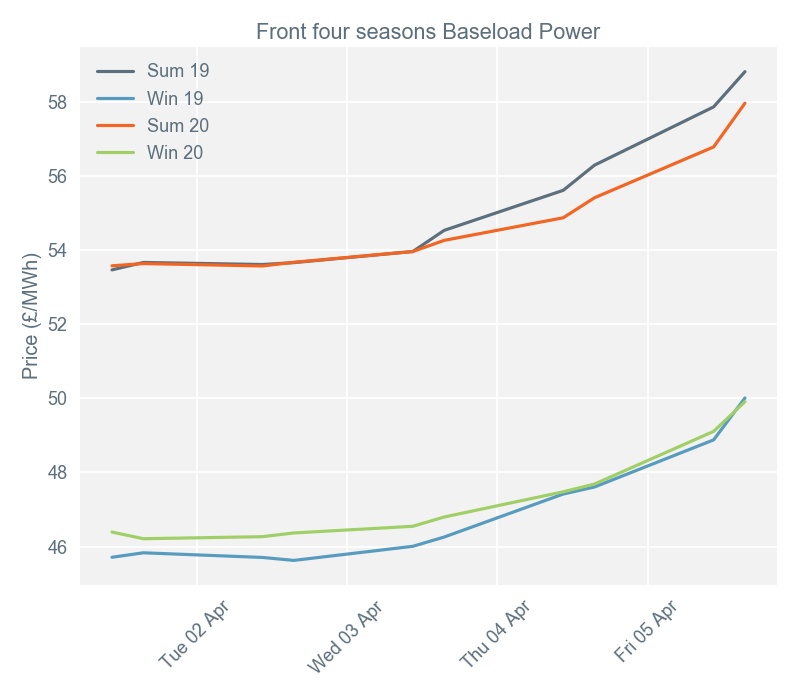 Secure and promote* (Seasons +1, +2, +3, +4) baseload contracts gained on average £4.39/MWh during week 14, making it the most bullish week of 2019 so far. Gas was the primary driver of this upward price trend, right from the start of the week. This was when the National Balancing Point (NBP) gas and European coal curves pushed the later-dated power products down. With a high number of Liquefied Natural Gas (LNG) shipments coming in, and withdrawal from storage sites continuing, Tuesday 2 April saw British natural gas NBP products sliding down in price. By the end of Tuesday 2 April, the Intercontinental Exchange (ICE) Rotterdam coal front year was also down $1.20/tonne compared to the previous day’s close. Wednesday 3 April reversed the momentum of the opening two days of the week, with the NBP gas curve and European coal forwards ticking upwards. On Thursday 4 April, the curve recorded bullish movement, primarily from the European carbon market pushing later-dated power products higher. Carbon gained €1.17/tCO2e (tonnes per carbon dioxide equivalent) compared to the settlement on Wednesday 3 April; the NBP gas curve, Brent Crude Oil futures and European coal forwards all saw further gains too. The week ended on Friday 5 April with the bullish pressure of the Norwegian gas supply to the UK bleeding into curve products. In addition, European coal forwards trading on the ICE exchange showed strength, with the Rotterdam coal futures gaining $2/tonne above the settlement on Thursday 4 April.